A forensic archaeologist has raised fresh questions over why no remains were found in the grave of an English cardinal in line to become a saint. 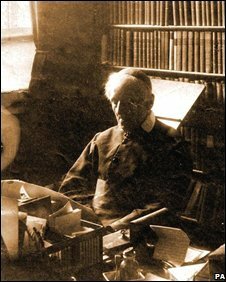 It comes just days before artefacts owned by Cardinal John Henry Newman go on display ahead of his possible beatification. Tens of thousands of mourners lined the streets of Birmingham in 1890 as Cardinal John Henry Newman's body was carried eight miles to its final resting place. Some 118 years later the Vatican ordered his remains be dug up. Roman Catholic leaders in Birmingham were asked to exhume his body by the Vatican as part of the process which could lead to the cardinal's beatification. The Vatican is investigating claims of a miracle attributed to him. But when Church officials opened his grave, they found no skeleton. They said it was "unsurprising" the remains had decomposed leaving only a few relics, including brass fittings. These, along with some of the cardinal's former possessions already held by the Church, will be placed on show in a glass-side casket in Birmingham Oratory on Friday and Saturday, ahead of a mass on Sunday. But a leading forensic archaeologist, with 20 years of experience excavating graves, has raised new questions over the disappearance of Newman's remains. 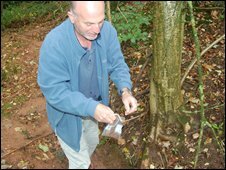 Professor John Hunter, from the University of Birmingham, tested soil samples from close to the grave site in Rednal, Worcestershire. He said the soil would not, in normal circumstances, have led to the complete decomposition of Newman's skeletal remains. "It would be, in my opinion, extremely difficult to explain the absence of skeletal material if this is the same soil as that of Newman's grave," Professor Hunter said. He said soil needed to be highly acidic with a lot of ground water washing through it in order for a body to fully decompose in about 100 years. But his tests appear to show the soil near the grave is not highly acidic. And he added remains, such as teeth, could have been missed if no archaeologists had been present at the exhumation. "It's very, very unusual for a body to vanish completely. "[The remains] were either not being looked for hard enough or, dare I say it, they weren't there in the first place." So what has happened to Cardinal Newman's body? Ian Panter, principal conservator at York Archaeological Trust, is examining the fragments of textiles recovered from the grave. He said it was possible Newman's skeleton could have entirely decomposed and added he had come across a similar case in York. "We have got three boxes of textile remains recovered from [Newman's] coffin and we may actually find remains of the body," he said. "We've got what we think might be a small fragment of bone. We need to carefully unravel the vestments and see what we've got. It will be a slow process." Peter Jennings, spokesman for The Fathers of the Oratory in Birmingham, which was tasked with digging up the remains, said the "utmost care" had been taken during the exhumation. He said representatives from Birmingham Health Authority, the Ministry of Justice, a doctor and a pathologist had been present. And he added the firm which had carried out the dig was one of the most experienced in the UK. "An expectation that Cardinal Newman had been buried in a lead-lined coffin proved to be unfounded," he said in a statement after the exhumation. "In the view of the medical and health professionals in attendance, burial in a wooden coffin in a very damp site makes this kind of total decomposition of the body unsurprising." Newman is in line to become the first non-martyred English saint since before the Reformation. In order for him to be canonised a miracle needs to be credited to him by the Vatican. It is investigating a claim that Jack Sullivan, a deacon from Boston, Massachusetts, was cured of a serious spinal disease after praying to the cardinal.